Crispy, flaky and juicy keto fried chicken fried to absolute perfection using the BEST low carb breading recipe out there. 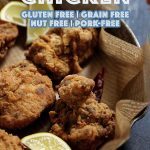 This low carb fried chicken recipe is entirely grain free, gluten free, nut free and pork free. 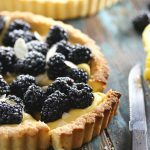 This recipe was originally published on May 19, 2017 and was since republished with better explanations, pictures, recipe and video. Do you miss Kentucky Fried Chicken and wish there were a low carb version? Well, look no further because I’m about to blow your mind with this AMAZING keto fried chicken recipe. It’s just like the real deal! That’s right. 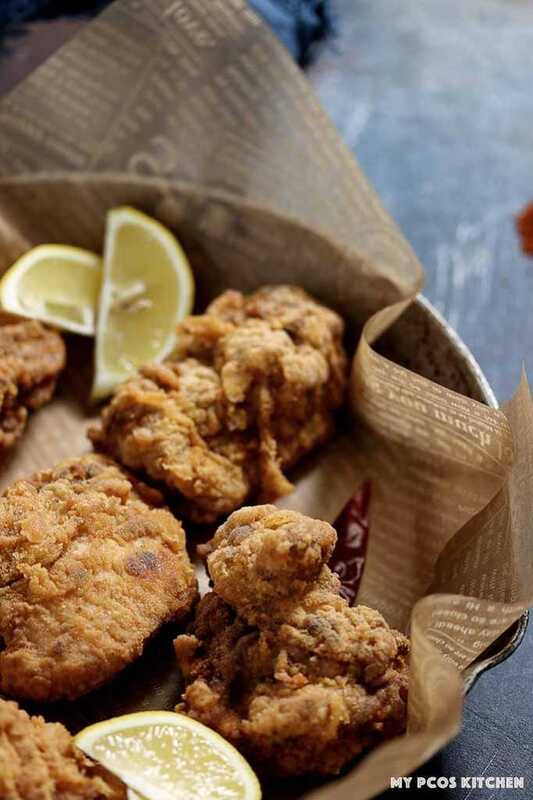 This crispy fried chicken recipe is just like KFC fried chicken. Actually, it’s even better! Did you know that one piece of Extra Crispy Chicken Thigh on the bone from KFC has 9g net carbs. That’s one tiny little piece of chicken for 9g! Plus, we all know that nobody eats just one piece. So 2-3 pieces of chicken thighs would equal to 18-27g net carbs just for chicken! And that’s just for chicken. This is where the best part comes in. 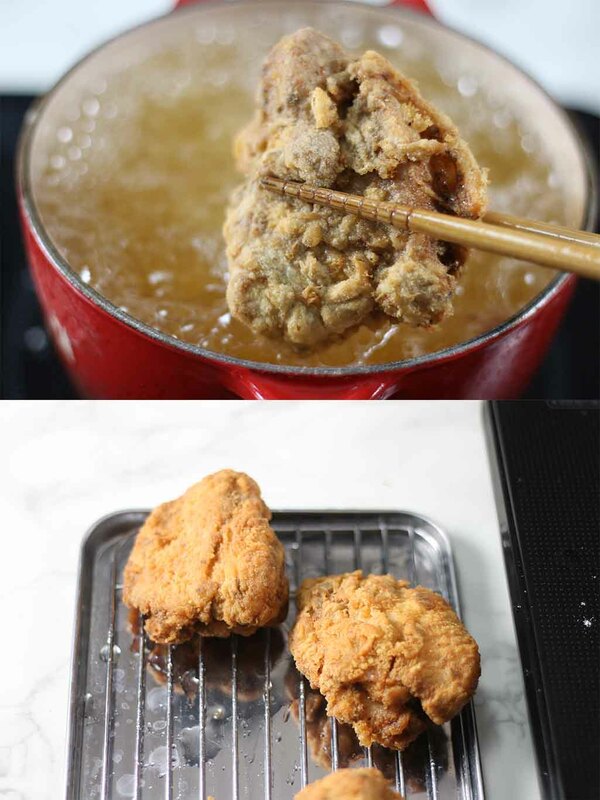 My recipe for this super crispy and juicy keto fried chicken has less than 0.5g per chicken thigh! If you add spices to your batter then the carbs will slightly go up, but will still be under 2g net carbs! And because this is fried with whey protein, it fills you up faster than normal breading so you don’t need to eat that many pieces of my low carb fried chicken recipe. 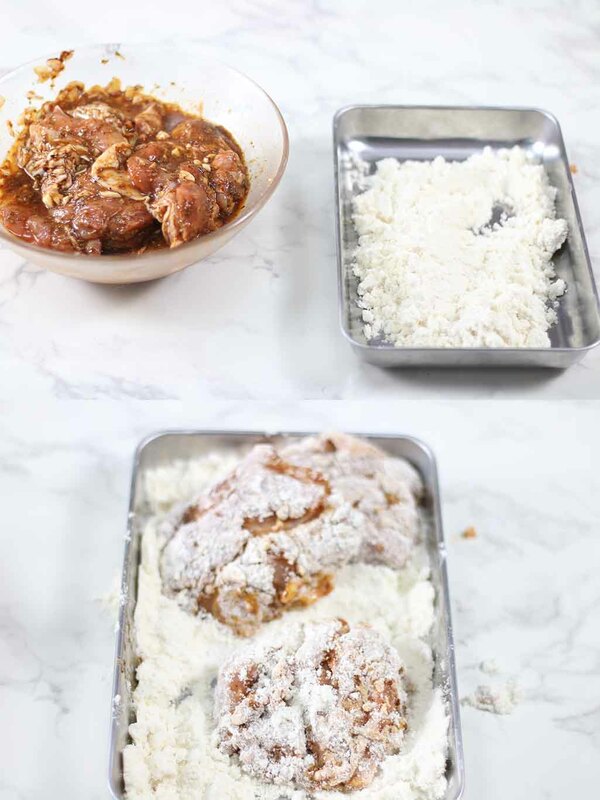 The secret to making the ultimate keto fried chicken breading isn’t with pork rinds, almond flour or parmesan. No, it’s much better than that. Pork rinds, almond flour or parmesan will never be a batter, which is what I was looking for when I created this recipe. That original fried chicken that we all know is crispy, flaky and super juicy. That’s not something that you can easily achieve with pork rinds, almond flour or parmesan. What you want to use is whey protein isolate. Whey protein is the ultimate secret to getting that perfect low carb KFC fried chicken. It sticks to the chicken, bubbles up in the oil and becomes super crispy when eaten, just like the real deal! What kind of whey protein is low carb? Not all whey protein are created equal. You’ll definitely want to check the ingredients label and nutritional information on your whey protein bottle. A lot of whey protein powders have added sugars or flavourings. You’ll want to choose an unflavoured whey protein from a reputed brand. My favourite brand for whey protein is NOW. It’s important you get whey protein isolate and not any other kind. Whey protein will usually have added ingredients like sugar, fillers and additives. On the other hand, whey protein isolate usually has no artificial ingredients added to it. Whey protein usually has 2g of carbs per 1/4 cup, whereas whey protein isolate has less than 1g of carbs per 1/4 cup. Can I deep fry anything else with whey protein? Yes, absolutely! This easy keto breading works for any type of protein. Whether it’s meat or fish, apply the same methods as this recipe and you’ll have different fried meals. My keto fish tacos recipe can use either whey protein or egg white powder to deep fry the fish. You can also change the recipe a little and make gluten free tempura and low carb corn dogs with whey protein! What type of oil should I use to deep fry? I recommend using either lard, avocado oil, beef tallow, or coconut oil. Depending on your budget and what you prefer in terms of health, some oils may be better options than others. My favourite oils for deep frying are lard and avocado oil. I usually use lard more often because it’s definitely more affordable than avocado oil. Both oils have high smoke points which make them great for deep-frying different dishes. Avocado oil is made up of about 70% monounsaturated fats, which is believed to increase the high-density lipoprotein (HDL), the good cholesterol in your body. Moreover, refined avocado oil has an extremely high smoke point at 500F/260C and extra-virgin avocado oil has a lower smoke point at 375F/190C. This means that you can safely use avocado oil to sautee, deep fry, bake or sear at high temperatures. Downside: It’s pretty expensive compared to other oils. Lard is made up of 60% monounsaturated fat, compared to butter which is only 45% monounsaturated fat. It has a slightly high smoke point at 375F/190C, which makes it perfect for deep frying things. Plus, it’s odorless and tasteless so makes it perfect for different dishes. Upside: It’s pretty cheap to buy or make at home. Beef tallow is made up of 42% monounsaturated fat. It has a high smoke point at around 420F/215C. Downside: It’s pretty expensive to buy, more than avocado oil, but can be super cheap to make at home. Coconut oil is made up of 92% saturated fat. It’s one of the healthy saturated fats and is very good for your health. It has a smoke point of 350F/175C. Downside: It can get a little pricey depending on the brand and whether it’s refined or extra virgin. It can also leave a strong coconut taste if it’s extra virgin and a slight coconut taste if it’s refined. What temperature should I deep fry my chicken? When making keto fried chicken with whey protein isolate, I suggest deep frying your chicken between 140-150C/280-300F. If you deep fry your chicken pieces at a higher temperature than that, the whey protein isolate will burn before the chicken can get cooked. To make the whey protein isolate stick to each piece of chicken, you absolutely must coat the raw chicken pieces in a raw egg beforehand. So you’ll add your spices and whatnot to your raw chicken and then add an egg to the chicken. Mix everything together and make sure that each piece is coated with egg. You could also just dip one piece of chicken at a time into whisked eggs. Once your chicken is coated with egg, you can then dip each piece of chicken individually with the whey protein isolate. Make sure to coat the chicken evenly so that you have the protein powder everywhere. Once it’s coated, you’ll simply pop the chicken into the hot oil and it’ll start to crisp and bubble up. The fried chicken breading will stick without problem as long as you coat your chicken with an egg beforehand. If you don’t, your batter will fall off the chicken in the hot oil. What part of the chicken should I use? The best part about this crispy fried chicken recipe, is that you can use any part of the chicken. I chose to use chicken thighs because they are super juicy, but you could use chicken breasts, chicken fillet, chicken wings, chicken drumsticks or bone-in chicken thighs. With skin or no skin? Totally up to you. If you like crispy chicken skin, then I suggest you leave it on. If not, then I suggest you cut it off. The first thing you’ll want to do is cut the chicken thighs into desired size. I prefer to have bite-size pieces, but you can totally do whole chicken thighs. Once your chicken is all cut up, you’ll want to add the spices to the chicken thighs. I decided to do a KFC style of fried chicken, which is why I added lots of different spices. But if you don’t feel like adding that many spices, you can always go simple and just add salt and pepper. I added almond milk to this recipe so that spices could be distributed evenly throughout the chicken thighs. You could also add oil to the chicken, but then the eggs wouldn’t stick as well to the meat. Let your meat marinate for about 30 minutes or more so that the chicken has time to absorb all the flavours from the spices. You’ll then preheat your oil to 140-150C/280-300F. Once your meat is ready, you’ll then start the breading process. Crack a couple of eggs into the chicken and mix until all of the chicken pieces have been coated well with the eggs. Add the whey protein powder to a large plate and dip one piece of chicken at a time into the protein powder. Make sure that all sides of your chicken is coated with the protein powder before frying. Add your pieces of chicken into the hot oil one at a time, but don’t over crowd the pot. You want to make sure that each piece of chicken deep fries properly and becomes crispy. Pro tip: Wash the utensils and bowls that touched the whey protein immediately as it’s harder to wash off once it’s dried. I usually use a meat thermometer to check whether my chicken is ready. When your chicken is 65C/150F and up, you can then take it out of the hot oil. Serve immediately as fried chicken is best served freshly out of the oil! 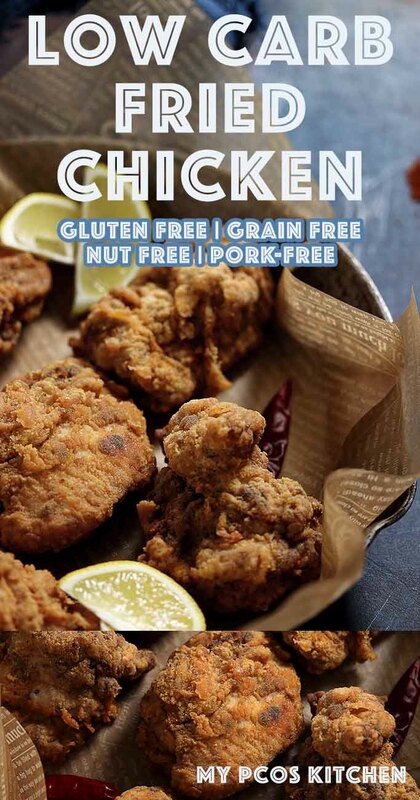 Can this fried chicken be made paleo-friendly? To make this fried chicken recipe paleo-friendly, you’ll want to check out my paleo fried chicken recipe. It’s extremely similar to this one, but instead of whey protein isolate, it uses egg white powder. Egg white powder is simply dehydrated egg whites so it’s completely dairy free. It also doesn’t raise your blood sugars like whey. It’s definitely more diabetic-friendly. If you don’t mind a little bit of carbs, you could always deep fry your chicken in tapioca starch, arrowroot flour, or cassava flour. Can I use an air fryer? Unfortunately, no. Whey protein isolate does not work in an air fryer. You need to deep fry the chicken the old-fashioned way, in hot oil. I’ve tried to air fry this fried chicken recipe multiple times in an air fryer, but it always ends up the same. The whey protein isolate powder hardens in the hot heat and doesn’t bubble up or crisp up since there is no oil to do so. You really need to add the chicken pieces to hot oil in order for the whey protein isolate to activate. 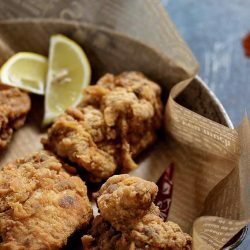 Can I reheat this low carb fried chicken recipe? Yes, of course! Just pop it into the microwave the next day and you’ll have delicious fried chicken ready in no time! Note that it won’t be as crispy anymore. I suggest using the leftover low carb fried chicken for making stir-fries! If you’re a dipping sauce kind of person, I got you covered! I also love to dip my crispy fried chicken pieces in different sauces. I give you a spicy dipping sauce for this recipe, but if you feel like changing things up, then you’ll definitely want to try dipping your keto fried chicken pieces into my sugar free sweet chili sauce recipe. If you feel like going Japanese, then you’ll definitely want to dip them in sugar free teriyaki sauce. 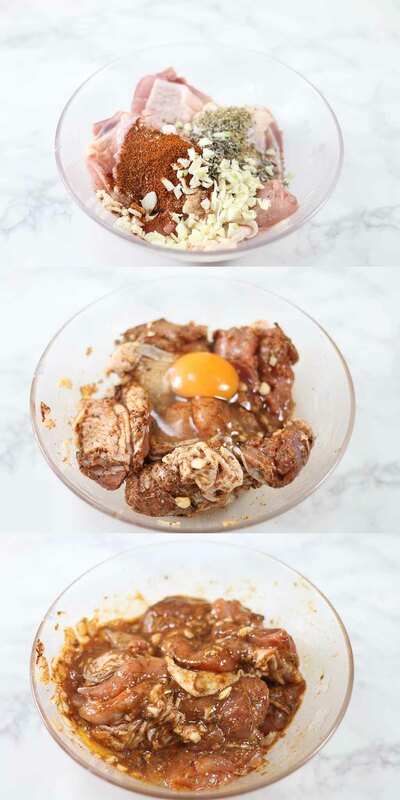 Just stir fry your fried chicken with the teriyaki sauce and you’ll have a delicious homemade Japanese dinner. If you don’t feel like making another sauce, then there are a couple of pre-bought sauces that I really love. After you’ve breaded your low carb fried chicken tenders, you can eat them as is, or make a different dish out of them! The great thing about this crispy keto fried chicken recipe is that it goes really well with lot’s of different sauces. You could make some healthy sweet chili chicken and add any kind of vegetables that you want. 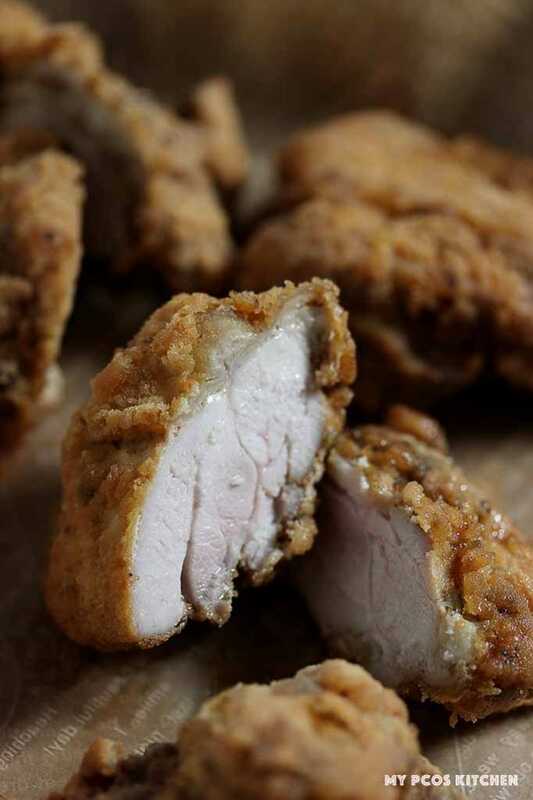 Another option you have is to grind up some chicken breast meat and make some delicious low carb chicken nuggets! You can either use whey protein isolate or egg white powder for these delicious little nuggets. Before making my low carb fried chicken recipe, make sure to read the following tips and ticks to make sure you make the BEST keto fried chicken recipe! Make sure to use unflavoured whey protein isolate and not whey protein powder. 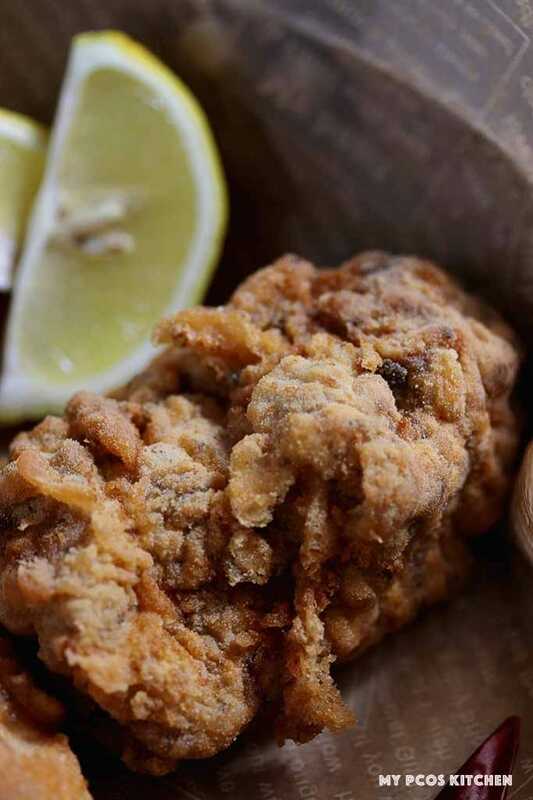 You can’t make this low carb fried chicken recipe with an air fryer. You must absolutely cover the raw chicken with an egg before coating with the whey protein isolate. This is how you ensure your fried chicken breading sticks to the chicken. If you eat dairy free, simply switch the whey protein isolate for egg white protein. Deep fry each chicken pieces in oil that’s about 140-150C/280-300F. Higher than that and your batter will burn before the chicken is cooked. You can use any type of spice you want. I chose to do a copycat KFC fried chicken recipe which is why I used that many spices. The BEST fried chicken you'll ever eat. You won't need nuts, pork rinds, or parmesan for this recipe! In a bowl combine the chicken with all the spices and the almond milk. Mix until well combined. Add the two eggs to the mixture and mix thoroughly. Heat the lard (or any frying oil you'll be using) between 140-150C/285-300F. When the oil is hot, dip each chicken piece, one by one, into the protein powder making sure all the sides are perfectly coated. Once coated, add the chicken pieces to your hot oil and fry 2-3 minutes until golden brown and cooked through. The inner temperature of each chicken bites should register at 65C/150F+ when the chicken is cooked through. Add the fried chicken on a wire rack or some paper towel to absorb the excess oil. Eat as is or with some spicy ranch dressing! 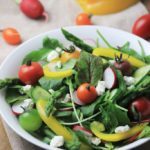 The ranch dressing can also be made as a salad dressing. The nutritional info does not include the ranch dipping sauce. This was so good! My whole family loved it. It was even good cold the next day. It was a win all around. I don’t really like deep frying, I find it a pain in the rear but this recipe was totally worth it. Thanks for a great and thorough recipe with great tips! Do you happen to know if I can use the THM brand of whey protein powder for this? Hi Angela, I’m not very familiar with THM products, but any brand of protein powder should work. Just tried this recipe. It was a big hit with all the family. Very crispy, and quick to make if a bit messy. maybe that’s just me. Recommend this for everyone to try. The spicy mayo especially good. Thanks for the recipe. Looks delicious but way to high in protein for me, for one meal. I do air fry my keto fried chicken, but I don’t use the whey powder. By the way, your video was on point! If you’d like to try using protein powder one day, I suggest using egg white powder. Slightly lower in protein grams than whey. Just tried this! I liked it a lot, I think this is the closest you can get to traditional fried chicken without carbs. I think next time i might try adding spices to the whey protein itself, just to give more of a kick. Will see how it turns out! wow, i am blown away by how delicious and crispy my chicken pieces were. thank you for sharing this recipe, i can finally have crispy fried chicken again. it actually taste better than my previous recipes using flour. i totally recommend trying this. This recipe is AMAZING! I can’t believe I’m something so wonderful and it’s keto. I’m hoping you can help me troubleshoot. I’m sure it’s me, not the recipe. I’ve made it twice now, shallow frying in a cast-iron skillet with refined coconut oil. Both times, a lot of the breading fell out into the oil and burned, and I had to start with fresh oil about halfway through the cooking process. What can I change so this stops happening? Thanks so much! Omg! This is the best of the best! I finally purchased the isolate protein powder and so glad I did. This will now be a fav recipe I will make over and over. The chicken was melt in the mouth with a light, flavorsome, crispy coating. Heaven! Best of all its on the keto good list. I wont be envious of those eating kfc cos I can make my own. Im looking fwd to trying all the other battered items that have been off the list for so long. These are a game changer. I can’t thank you enough for posting this recipe. I switched out some of the spices (for personal taste), but otherwise followed the recipe. I can’t belice that I can have fried chicken now. I also used the coating to make a mozzarella stick with my last piece of string cheese. I’m telling you that angels sang! Wow! Truly delicious! Thank you, thank you, thank you! Seriously. Probably the best fried anything I’ve ever had! Who would of ever thought this would be so good. It took me a bit to get the oil temp right but after I did it was a breeze. I marinated the chicken during the day and fried it tonight after the family got home. Perfect texture, light, crunchy, juicy! Thank you. Love the videos! Love your blog. Now I just need to learn how to use chopsticks! Many blessings and thank you for moving past pork rinds! 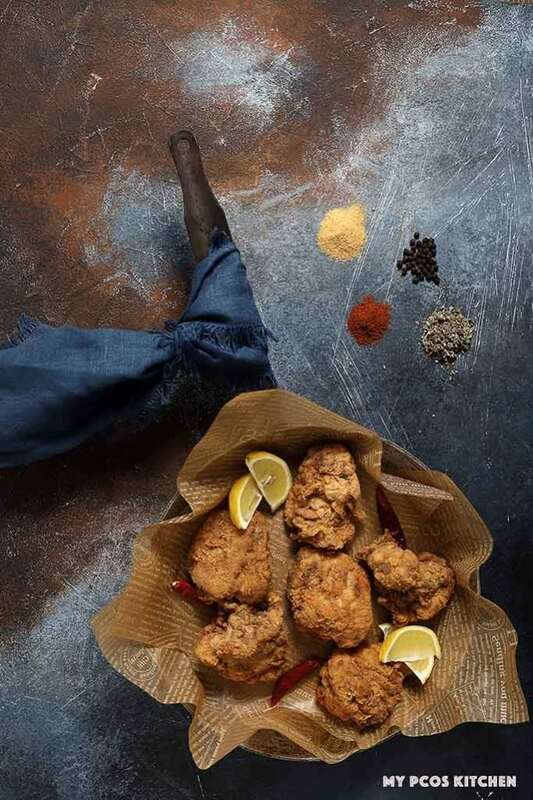 I have been dying for some fried chicken and I can’t wait to try this recipe. Thank you so much! We used the batter on fish And it was AMAZING!! Wow! The best I’ve had so far! Will go a little lighter on the garlic and more on the onion next time. We like onion more than garlic over here, but this will be my only recipe for fried fish and chicken. Thank you so much!!! Pinning this. Thank you for the recipe. I can’t visualize stirring in the chicken pieces nor then adding eggs and stirring. I figure it out somehow though. This recipe is a game changer. Five stars for sure. My husband has no objection to this batter on his food in the future and he is non keto. Thanks!! Do you have to use almond milk? What about heavy cream? Is the nutritional information here including the ranch dressing, or just the chicken? It includes the ranch dressing! Thank you for your great recipe! Could we substitute the protein powder for coconut flour? Sure, it’ll be coconuty though! Egg white powder also works. I used half protein powder and half coconut. They were great. Thanks for the awesome recipe. I’d like to try this. I’ve discovered the wonders of WPI for frying chicken. Really does taste like a traditional flour coating. Your spice blend here sounds delicious! SO FREAKING DELICIOUS! hubby says we need to have it once a week at least lol Thank you SO much for your wonderful recipe! Made these for dinner. They were amazing!! !also occurred to me that this is perfect breading for pop corn shrimp or calimari. Thank you so much for the great recipe! Excellent flavor and crisp. I used egg white protein instead of the whey and it came out perfect. I found a new favorite! 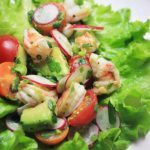 Try with almond milk and an egg substitute you will find that the recipe is just as good and you can make your own pressing you do not have to use store-bought dressing I like the avocado lime dressing with this is phenomenal. There are ways to make it so that it can be vegan. Can this be done in an air fryer? Do any adjustments need to be made to the recipe? Hi Marla, I believe I mention it somewhere in the post. It doesn’t work with an air fryer as the protein powder activates when it hits hot oil!